We generally eschew products containing unnecessary punctuation in their names, but we we’re willing to make an exception for the Ego! Smartmouse, a new mouse that promises more than enough functionality to rule your house. Like plenty of promising products, it currently has a Kickstarter campaign going with the goal of raising £20,000, or about $30,324 USD. So just what does this mighty mouse do? It’s a mashup of a mouse, flash drive, remote, Wiimote, and VGA camera – because, hey, what device doesn’t need a camera in it? The Ego! is powered by an 400 MHz ARM9 microcontroller and runs a version of Linux with up to 8GB of flash storage that can also be used to easily transfer files between computers. In addition to the traditional optical mousing sensor, the mouse is packed with an accelerometer, gyroscope, and compass so that it can be used for everything from manipulating a 3D model to flying a plane in a simulator game. There’s also a small touch strip, presumably for scrolling, and a few LED lights for good measure. While the mouse connects via Bluetooth, the Ego! generates a QR code that it then reads with its VGA camera to make the pairing between devices go faster. There are also hand gestures for accessing the files stored on the mouse and for transferring them. The Ego! even stores Web bookmarks and remembers logins and passwords for favorite sites. But that’s not all. The Ego! also works as a 3D mouse and remote for controlling media playback while your computer is hooked up to your TV. Plus, it works with smartboards as a presentation mouse for business or classroom applications. If that wasn’t enough, it vibrates. Yes, the mouse vibrates whenever you receive a new email or have an appointment. Best of all, it charges via USB and promises low power consumption. The Kickstarter page says that it charges via micro-USB, but the video on the page certainly looks like it’s using mini-USB. Perhaps the prototype uses mini, but the production will use micro-USB, which is the standard connector for most non-Apple smartphones. If you’re interested in backing this wonder mouse, the Ego! 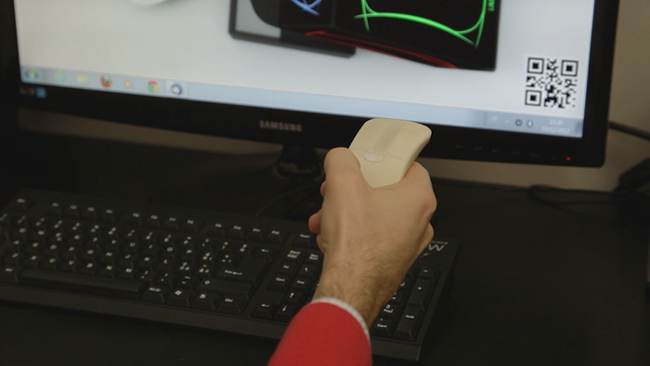 Smartmouse Kickstarter campaign will be running for the next 44 days. About $106 USD will guarantee you a 2GB Ego! Smartmouse with an additional 2GB of cloud storage. This device does seem almost too good to be true based on all of the features it offers, but we think it’s just crazy enough to work.